One year ago at this time, I was knee deep in emotion. My middle child, my only boy, was getting ready to graduate from high school. This wasn’t my first rodeo. I’d been through this grad party thing before with my oldest daughter, but like their personalities, it wasn’t the same. If you know me, it’s not a surprise that while I wanted to have good food and stuff, I was way more interested in figuring out how to help my son (and me, if I’m honest) relive some of the best moments of his life and tell his story. I’m passionate about creating keepsakes for life and not just displays for the party. My biggest thing is that all of my kids have a “Life is a Journey” album. This album takes them from birth to graduation. It by no means has every picture I’ve ever taken. It’s a snapshot of my favorites. It includes some groupings of his sports stuff, birthdays, family, vacations, etc. Best of all, it includes some of my best advice for living life. I also put out some of his other albums throughout the years. Not all. I chose ones that I thought the people attending the party might enjoy. Let’s not make this hard. I found some of my favorite pictures, made sure I covered as many people as I could that I thought would be attending the party, and printed them at Walmart One Hour Photo. I grabbed some ribbon at Michaels and some clothes pins, and slapped ‘em up. In all fairness, the outside plan was cooler than this. I was going to wrap the ribbon around the bottom beams of our deck, but again…rain. Ben loves 2 things…a lot. Golfing and Fishing. If your graduate has loves…feature them! First of all, please look up and notice that the ribbons are hanging from a cool old golf club. Also note, that had the party been outside, this was going to be hanging from our deck, which would have been cooler. 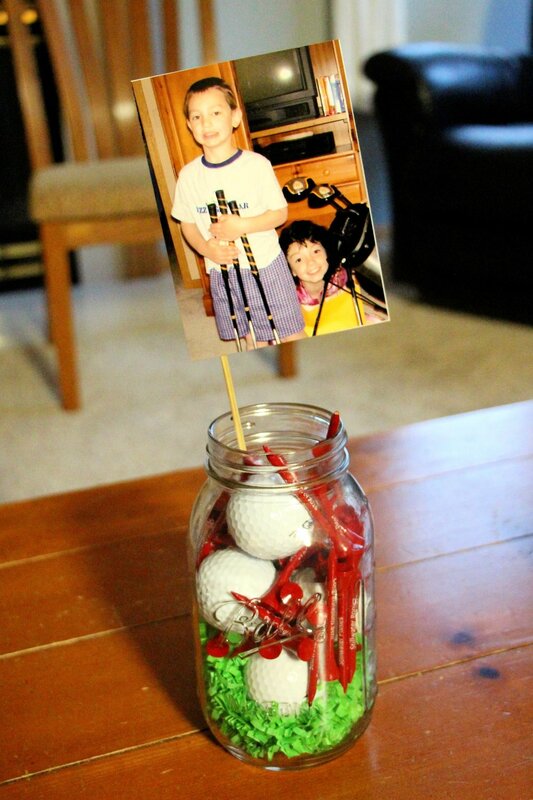 The photos are from Ben’s golf career. This was fun because so many guests were friends and family from his golf team and it was fun watching them relive the memories. Also, in between the photos, we hung medals he had won throughout the years. I LOVE displaying photos in this format. I have several of these prints throughout my house…my daughter has one with photos of her artwork and in our basement is one with favorite photos from our trip to Italy and Greece. When I started looking at Ben’s pics through the years, there were a ton of fishing pics, so this was a great fit AND something he’ll have beyond the party. I had to do it. Pictures are my thing. On the tv, we had ‘the requisite slideshow’ running. 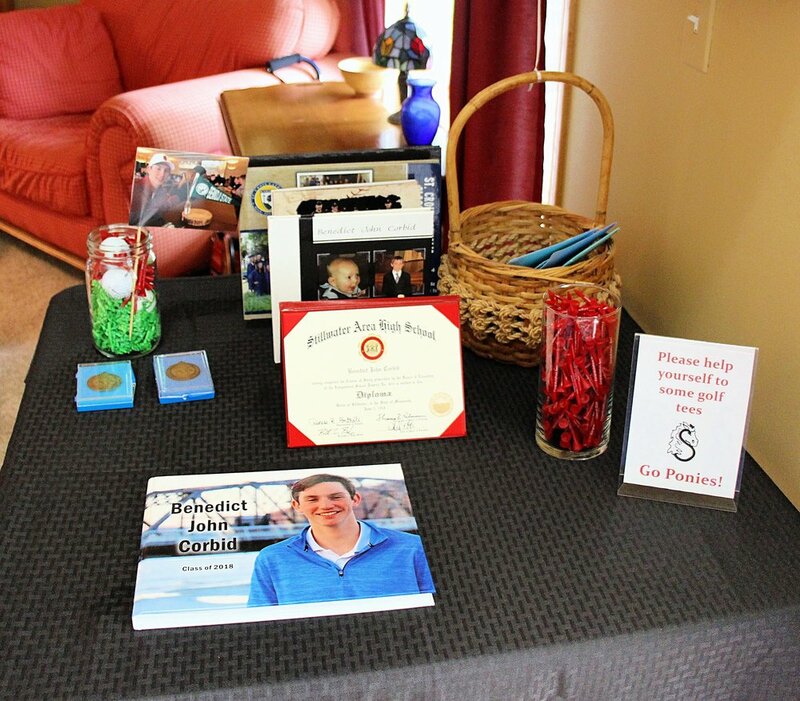 Again, my focus is on keepsakes for life, so not only could people at the grad party enjoy it, but Ben will have it forever…and so will I.
You’ve heard me say it, you can’t do this wrong. Anytime you get the memories out, it’s a win. Photos spark conversation, laughter, stories and some beautiful interaction. Don’t make it hard, make it meaningful. Need some help getting started? Check out my blog: “Attn: Parents of Graduates, you can’t do this wrong”. Need some help telling your graduate’s story and getting it done, give me a call.